I've been busy working on new applique designs for my handbags this past week. I'm expanding on some of my original designs and creating completely new images. Expect to see lots of floral designs and more nature inspired creations! To make an applique I start with a free hand drawing done directly on a piece of medium weight cardboard. Once I am satisified with the final image I cut it out to create a stencil. When I am ready to make an applique, I use the stencil to draw the image onto a product called HeatnBond. See this great tutorial for more information on how to use HeatnBond for you applique work. Improvised cherry blossoms and daisies are just some of the new applique designs you'll be seeing in my shop very soon! Hope everyone had a wonderful Thanksgiving yesterday. For those of you outside of the United States I hope you had a wonderful day as well! Thanks to Candyragz I had my Wayfarer Purse featured on the front page of Etsy yesterday! Check out her shop for handmade cards, vintage goodie packs and many other sweet items. Check out the new bags in the shop!The Wayfarer Purse is made from handwoven and hand dyed hemp and is perfect to take with you on all your journeys. I'm waiting for a shipment of a few more yards of this wonderful hemp to arrive. It has a linen-like weave and a beautiful natural raw quality. I also used this lovely hemp fabric to make a two tone Downtown Bag. I never worked with corduroy before so I recently purchased some in a couple of yards to try out. It does have some similar qualities to velvet which I am familiar with although velvet is a lot more difficult to work with. Check out The Downtown Bagin olive green corduroy that is now available in my shop. More creations will be added to the shop very soon! It's Monday and I look forward to the day. Monday is the first day of the week that I get to concentrate on my handbag designs full time. I usually work in my studio Monday through Thursday, designing, cutting out fabric and sewing up my creations. Since I work part time at an outside job Friday through Sunday I don't get much designing done on those days. If I have some energy after work I will cut fabric for new bags so they are ready to sew. I dream of the day I can do Pesky Cat Designs full time! Today I plan to create a few handbags with the new corduroy fabric that I recently purchased. I also have a Wayfarer and a Downtown Bag in Hemp to finish up. If time permits I will post some of my finished creations later in the day. Have a great day! I purchased some new fabric online a few days ago and it arrived today! I've never worked with corduroy before so I only bought a few yards to experiment with. I love love love the colors! They are Legion Blue, Picante and Olive Branch. I like to buy fabric that appeals to me, either by color or texture, and then bring it home and have it inspire me to design something. I need to see the fabric in person to know what bag it should become. I'm definitely seeing some Downtown Bagsin this new corduroy. Hmm..... I think I still need some more quality time with my fabric before I decide! Yesterday I finished up a batch of new creations. The Wayfarer posted above is made out of a handwoven hemp fabric I purchased at a very nice shop on Etsy called Rainy Day Supply. This fabric is 100% eco-friendly and was grown, spun and dyed with natural plant dyes by a fair trade collective of Hmong hilltribe women.The fabric has a linen-like look to it. I love its natural raw qualities. I can't wait to make more handbags with this unique fabric! I didn't get to work right away as I said I would in my post below. I was distracted by an invite to have breakfast at a diner. Several eggs later I returned home and began working on some new bags. I still have to sew linings for all the handbags posted above. They're already cut out and marked. I better get back to work. The only thing that will stop me now is one of my favorite TV shows, Ghost Hunters. Well, that's not until much later tonight so I should be able to accomplish quite a lot before then. Wish me luck! 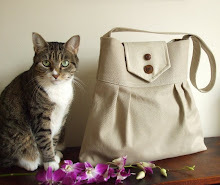 Check out the Pesky Cat Designs shop for lots of new handbags. Posted above are just a few of my new additions. By the way, all Pesky Cat Designs are vegan friendly! Tomorrow I plan to add lots of new handbags to the Pesky Cat Designs shop. 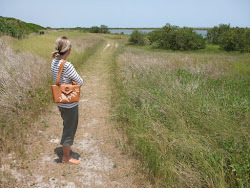 I'll have the Wayfarer Purse, see post below, available in many different colors with appliques of birds and leaves. A new Downtown Bag will be added as well. Check my shop Monday afternoon for the new additions! The purse posted above is one of my favorite designs and works so well with different appliques. I've been trying to come up with a name for it for ages. Nothing ever seemed quite right to me. After brainstorming a while today I decided to ask my partner what he thinks. He's always so supportive and helpful. Well, he thought of The Wayfarer! The shape of the bag reminds him of the wayfarer sunglasses. I see what he means. It's also a great name because you can take this purse with you on all your journeys. It's perfect for your travels through the city or the country side. The Wayfarer is a purse you can take with you everywhere and always be unique. Check out my shop next week for lots of new Wayfarers! I'm waiting for my new camera to arrive. I've got quite a few new items to photograph so I am a bit impatient. A few days ago my old camera dropped to the ground and ceased to work. It was very sad indeed. I have lots of new purses and totes available with cool appliques of birds and foliage. I've been so inspired by the falling leaves and all the fall colors. Can't wait to add my new creations to the Pesky Cat Designs shop! I was quite inspired by nature after my hike in Harriman State Park last week. See my previous post for some photos taken that day. I was reminded that my inventory of handbags and accessories with nature inspired appliques are running low. So this week I plan to create some new items in earth tones with botanical appliques. Perhaps a bird or two as well! Last Thursday my partner Tom and I decided to leave the city and drive out to Harriman State Park, one of New York's largest state parks located about 30 miles north of New York City. There are over forty marked hiking trails (225 miles total) and another 57 unmarked trails. 18.8 miles of the Appalachian Trail are located within the park. We decided to hike out to the Lemon Squeezer, an unusual rock formation in Harriman that is located at the intersection of the Appalachian Trail and the Arden-Surebridge Trail. We started our hike, which was about 3.5 miles round trip, from the Elk Pen Parking Area on Arden Valley Road. Although it rained several times during our hike we still throughly enjoyed it. Trees growing out of the rock formations! The entrance to the Lemon Squeezer! Photographing my handbags and accessories has been a big learning experience for me since I opened my online shop, Pesky Cat Designs. A good image of your product is so important. There's so much to decide on. Should I have a clean white background so the item stands out, or a prop such as a flower or vase to add interest to my subject or should I photograph my item in an interesting location? Should I use photo lights or daylight? And on and on!